A tumor is a lump or mass of tissue that forms when cells divide uncontrollably. For most bone tumors, the cause is unknown. A growing tumor may replace healthy tissue with abnormal tissue. It may weaken the bone, causing it to break (fracture). Aggressive tumors can lead to disability or death, particularly if signs and symptoms are ignored. Multiple Myeloma, the most common primary bone cancer, is a malignant tumor of bone marrow. It affects approximately 20 people per million people each year. Most cases are seen in patients aged 50 to 70 years old. Any bone can be involved. 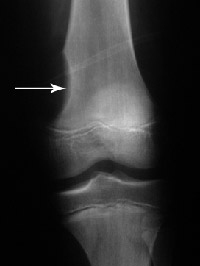 Osteosarcoma is the second most common bone cancer. It occurs in two or three new people per million people each year. Most cases occur in teenagers. Most tumors occur around the knee. Other common locations include the hip and shoulder. Ewing's sarcoma most commonly occurs between age 5 and 20. The most common locations are the upper and lower leg, pelvis, upper arm and ribs. Chondrosarcoma occurs most commonly in patients 40 to 70 years of age. Most cases occur around the hip and pelvis or shoulder. There are many types of benign bone tumors. The more common types include non-ossifying fibroma, unicameral (simple) bone cyst, osteochondroma, giant cell tumor, enchondroma and fibrous dysplasia. If you think you might have a bone tumor, see your doctor as soon as possible for diagnosis and treatment. The doctor will collect detailed information about your general health and the tumor's type, size, location and possible extent of spread. Most patients with a bone tumor will experience pain in the area of the tumor. The pain is generally described as dull and achy. It may or may not get worse with activity. The pain often awakens the patient at night. Although tumors are not caused by trauma, occasionally injury can cause a tumor to start hurting. Injury can cause a bone weakened by tumor to break, which often leads to severe pain. Some tumors can also cause fevers and night sweats. Many patients will not experience any symptoms, but will instead note a painless mass.Medical history and physical exam: Tell the doctor your complete medical history. This includes any medications you take, details about any previous tumors or cancers that you or your family members may have had, and symptoms you are experiencing. Your doctor will physically examine you. The focus is on the tumor mass, tenderness in bone and any impact on joints and/or range of motion. In some cases, the doctor may want to examine other parts of your body to rule out cancers that can spread to bone. Imaging and tests: Your doctor will probably obtain X-rays. Different types of tumors exhibit different characteristics on X-ray. Some dissolve bone or make a hole in the bone. Some cause extra formation of bone. Some can result in a mixture of these findings. 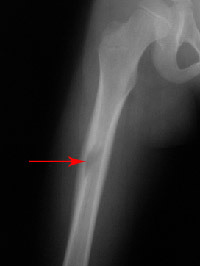 Figure 1a: Shows a tumor causing a saucer-like erosion in the end of the thighbone. 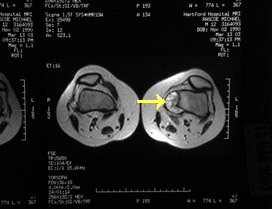 Figure 2a: Shows a bone tumor in the middle of the femur exhibiting a combination of characteristics. 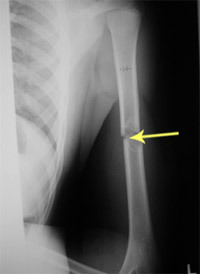 Figure 3: Shows a fracture through a tumor in the middle of the upper arm bone. Some tumors have characteristic findings on X-rays. In other cases, it may be hard to tell what kind of tumor is involved. You may need more imaging studies to further evaluate some tumors. These may include MRI (magnetic resonance imaging) or CT (computed tomography). 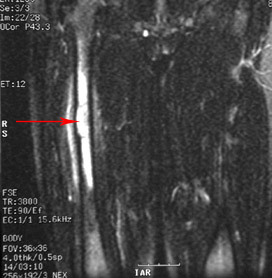 Figure 1b: Shows the cross-sectional MRI appearance of the tumor seen in Figure 1a. The MRI corresponding to the X-ray seen in Figure 2a is seen in Figure 2b (coronal view) and Figure 2c (cross-section). You may also require blood and or urine tests. If these tests are not adequate to diagnose your tumor, you may require a biopsy. A biopsy involves removing a sample of tissue from the tumor. The tissue sample is examined under a microscope. There are two basic methods of doing a biopsy. Needle biopsy: The doctor inserts a needle into the tumor to remove some tissue. This may be done while you are under local anesthesia in the doctor's office. Or a radiologist may do it, using an X-ray machine or CT or MRI scanner to help direct the needle to the tumor. Open biopsy: The doctor uses surgery to remove tissue. This is generally done through a small incision while you are under general anesthesia in an operating room. Benign tumors: In many cases, benign tumors just need to be watched. Some can be treated effectively with medication. Some benign tumors will disappear over time; this is particularly true for some benign tumors that occur in children. Certain benign tumors can spread or become cancerous (metastasize). Sometimes your doctor may recommend removing the tumor (excision) or using other treatment techniques to reduce the risk of fracture and disability. Some tumors may come back–even repeatedly–after appropriate treatment.Malignant tumors: If you are diagnosed with a malignant bone tumor, you might want to get a second opinion to confirm it. If you have bone cancer, your treatment team may include several specialists. These may include an orthopaedic oncologist, a medical oncologist, a radiation oncologist, a radiologist and a pathologist. Treatment goals include curing the cancer and preserving the function of your body. To treat malignant bone tumors, doctors often combine several methods. Treatment depends upon various factors including whether the cancer has spread. Metastatic stage cancers have spread elsewhere in the body. Tumors at this stage are more serious and harder to cure. Generally the tumor is removed using surgery. Often radiation therapy is used in combination with surgery. Limb salvage surgery removes the cancerous section of bone but keeps nearby muscles, tendons, nerves and blood vessels. If possible, the surgeon will take out the tumor and a margin of healthy tissue around it. The excised bone is replaced with a metallic implant (prosthesis) or bone transplant. Radiation therapy uses high-dose X-rays. This kills cancer cells and shrinks tumors. Systemic treatment (chemotherapy) is often used to kill tumor cells when they have spread into the blood stream but cannot yet be detected on tests and scans. Chemotherapy is generally used when cancerous tumors have a very high chance of spreading. When treatment for a bone tumor is finished, you may need more X-rays and other imaging studies. These can confirm that the tumor is actually gone. You may need to have regular doctor visits and tests every few months. When the tumor disappears, it is important to monitor your body for its possible return (relapse). Research on the Horizon/What's New? Genetic research is leading to a better understanding of the types of bone tumors and their behaviors. Researchers are studying the design of metallic implants. This is allowing better function and durability after limb salvage surgery. Advancements in the development of prosthetic limbs include computer technology. This is leading to better function and quality of life after amputation. Research into new medications and new combinations of older medications will lead to continual improvements in survival from bone cancers. Your doctor may discuss clinical research trials with you. Clinical trials may involve the use of new therapies and may offer a better outcome. For more information or to make an appointment, call 860-679-6600.